Cebu Pacific Air’s long-haul unit is entering a new phase of growth which will also see it evolve to pursue more transit traffic. Cebu Pacific initially envisioned a pure LCC model for its long-haul low-cost unit, relying almost entirely on point to point traffic, but is now looking to build up connections, particularly to feed its new Manila-Sydney route. In Sept-2014 Sydney and Kuwait will become Cebu Pacific’s second and third long-haul destinations after Dubai, where its performance has improved in recent months following a dismal start in 4Q2013. The carrier’s A330 fleet, which now consists of four aircraft with a fifth to be added by the end of Aug-2014, has until now been primarily used to upgauge short-haul routes. The upcoming launch of services to Australia and Kuwait will be followed by Saudi Arabia in 4Q2014 and Hawaii in early 2015. Sharjah may also be launched in 2015 as Cebu Pacific considers leasing additional A330s. This is the first in a two part series of analysis reports on Cebu’s now 14-month-old widebody operation. This part focuses on the new Manila-Sydney route and connection opportunities beyond Manila. The second part, to be published later this week, will look at Cebu’s plans for Saudi Arabia and the prospects of a Sharjah service. It will also examine the overall Philippines-UAE market including Cebu’s performance in Dubai. Cebu Pacific began operating A330s in Jun-2013, becoming the fourth LCC in the Asia-Pacific region with widebodies after Jetstar, AirAsia X and Scoot. Daily services to Dubai were launched in early Oct-2013 after an initial period of operating the first two A330s on regional routes. Cebu Pacific currently operates four A330-300s in single-class configuration with 436 seats. Cebu Pacific is the only long-haul LCC with an all-economy configuration. Jetstar, AirAsia X and Scoot all offer a premium product, with Jetstar and Scoot providing a recliner style seat and premium economy-like product while AirAsia X offers an angled lie-flat business seat. Cebu Pacific still does not see a need to introduce a premium product as its target market is overseas workers. The Philippine market is extremely price sensitive with limited premium demand. Cebu Pacific however is starting to recognise the value of feed. Its initial long-haul model envisioned relying on point to point traffic with a focus on the Manila-Middle East market. This market consists predominately of Filipino workers and to a lesser extent visiting friends and relatives (VFR) as Cebu Pacific’s low fares stimulate more frequent visits by families living back in the Philippines as well as more frequent trips home by the expatriates. Cebu Pacific for several years has offered a transit product which, for an additional fee, offers a through check-in including transfer of checked bags. 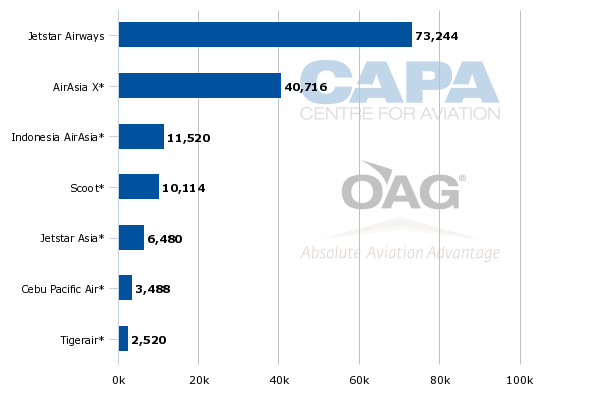 But the carrier’s overall portion of transit traffic is very low – less than 5% – including from widebody flights. Cebu Pacific has no intention of migrating to an origin and destination pricing model or starting to work with global distribution system providers, initiatives AirAsia X has adopted in pushing up its transit traffic component to nearly 50%. Cebu Pacific plans to stick with a traditional sum of sectors LCC approach in pricing connections. The airline, however, is hybridising to some extent by promoting more connections between Cebu Pacific flights and onto flights operated by other airlines. Cebu Pacific sees its Manila-Dubai route, which resumed in late Jul-2014 after the Dubai airport fully reopened, as continuing to consist nearly entirely of point to point traffic. But Cebu Pacific is aiming to generate a larger portion of transit passengers on its new Sydney-Manila route, which it plans to launch on 9-Sep-2014 with four weekly flights. The general manager of Cebu Pacific’s long-haul division, Alex Reyes, told CAPA prior to CAPA’s recent Australia Pacific Aviation Summit in Sydney that the carrier is particularly pushing connections to Hong Kong. Sydney-Hong Kong is a large local market served with five daily non-stop flights, including four from Cathay Pacific and one from Qantas. But the market has not grown over the past several years due to bilateral constraints. Singapore Airlines long-haul LCC subsidiary Scoot serves Singapore-Sydney while AirAsia X serves Kuala Lumpur-Sydney and Jetstar serves Bali-Sydney. AirAsia X’s new Indonesian affiliate is also expected to launch Bali-Sydney service by the end of 2014. Scoot and AirAsia now offer a one-stop product in the Sydney-Hong Kong market but routing passengers via Singapore or Kuala Lumpur is more circuitous than Manila. Currently the fastest connections on AirAsia/AirAsia X from Sydney to Hong Kong is about 16 hours (with a layover in Kuala Lumpur of about three hours) while the fastest connection from Hong Kong to Sydney is about 14 hours (with a layover of only slightly more than one hour). Scoot connections are generally longer, ranging from 15 to 19 hours (includes Singapore-Hong Kong flights operated by Scoot and Scoot partner Tigerair). In comparison, Cebu Pacific will offer a total journey time of about 12 hours in both directions (slightly less than 12 hours on Sydney-Hong Kong and slightly more than 12 hours on Hong Kong-Sydney). Cebu’s Sydney-Manila flight lands at Manila at 17:30, or 100 minutes before the last of Cebu Pacific’s flights from Manila to Hong Kong. The third of Cebu Pacific’s four daily flights from Hong Kong lands in Manila at 21:30, or just under three hours before the new 00:15 departure for Sydney. Cebu Pacific is also offering an array of domestic connections at Manila, which will particularly be targeted at Australians going on holiday because the main leisure destinations in the Philippines (such as the islands of Boracay and Palawan) can be only accessed by domestic flights. Cebu Pacific is hoping to stimulate demand in the outbound Australian market – which grew by 25% over the last two years – although the Filipino worker and VFR segment is its main focus. Cebu Pacific says there are about 170,000 Filipinos living in Australia, including about 70,000 in New South Wales, while in 2013 only 56,000 Australians visited the Philippines. There are huge opportunities for the Philippines' emerging tourism sector to attract more Australians, particularly as lower fares make holidays in the Philippines as inexpensive as Bali. But there are likely more growth opportunities for Cebu Pacific in carrying passengers beyond Manila – both Australians and North Asian residents. Mr Reyes singled out Beijing, Seoul, Shanghai, Taipei and Tokyo as well as Hong Kong. He pointed out that flight times from Manila to all these destinations are two or three hours less compared to Kuala Lumpur. Flight times from Singapore are similar given the close proximity of Kuala Lumpur and Singapore. As flight times from Sydney to Singapore, Kuala Lumpur and Manila are similar, routings via Manila are more direct. But quick connections will only be available in both directions for Hong Kong. Beijing, Seoul, Shanghai, Taipei and Tokyo are only served by Cebu Pacific from Manila with one daily flight or less, making it more difficult to offer a competitive product from a schedule perspective. AirAsia X generally provides faster transit times as it serves most of these destinations as well as Sydney with two daily flights. Among these five destinations Scoot currently only provides a one-stop product in the Sydney-Taipei market. AirAsia X has become a major player in the Australia-North Asia market over the past year as it has added a second daily flight to Sydney, Melbourne and Perth, providing a huge increase in capacity that could be not supported entirely by the Malaysian market and connections within Southeast Asia. The entrance of Cebu Pacific adds even more LCC capacity in the Australia-Southeast Asia market, providing another increase which once again will require a significant share of connecting traffic to North Asia to be sustainable. With the launch of services from Cebu Pacific, Australia will have all four long-haul LCCs from the Asia-Pacific region with over 100,000 weekly seats. This includes about 50,000 seats from Australia-based Jetstar Airways, which has roughly two thirds of its international capacity at its long-haul unit. There are also about 45,000 weekly short-haul LCC seats in the Australian international market operated by Jetstar Airways, Jetstar Asia, Indonesia AirAsia, and Tigerair. Cebu Pacific could still attract some price sensitive customers in the Sydney-North Asia excluding Hong Kong market who do not mind long layovers or stopovers in Manila in one direction. But the real volumes would come if and when the carrier adds frequencies in its North Asian markets. Cebu Pacific has the setup in Manila to offer fast connections but without the schedules this will not be fully utilised. Mr Reyes says Cebu’s integrated operation at Manila Terminal 3 enables connections in as little as one hour with through baggage. Taipei, which is already a large connection market for the Australian long-haul low-cost operations of Scoot and AirAsia X, could particularly be attractive if Cebu Pacific expands on the Manila-Taipei route. Currently Cebu Pacific’s only flight from Taipei arrives in Manila at 03:05, or three hours after the Sydney flight departs (requiring a 21 hour connection time), while from Sydney to Taipei a transit time of just under five hours is available. There are currently only four non-stop weekly flights from Sydney to Taipei, all on full-service flag carrier China Airlines. In the Sydney to Beijing, Shanghai and Seoul markets a long connection (15 to 20 hours) is similarly required on the return. Tokyo has about a 12 hour connection from Sydney and about an eight hour connection on the return. Connections to Japan could improve as Cebu Pacific has been expanding rapidly in the Japanese market since a new bilateral agreement last year opened up opportunities for Filipino carriers. Cebu Pacific over the past year has launched services to Tokyo Narita and Nagoya, while upgrading Osaka, which had been its only Japanese destination, to daily and is now seeking to take over one of the two daily flights to Haneda recently dropped by PAL. Narita is currently the only Japanese airport served non-stop from Sydney, according to OAG data. The route is served only by full-service carriers, with Qantas and oneworld partner Japan Airlines each operating one daily flight on the route. Jetstar serves Tokyo from Cairns, Gold Coast and Melbourne with domestic connections at both ends, using Jetstar Airways from the three Australian gateways (including to Sydney) and Jetstar Japan from Narita. Opportunities for Cebu Pacific in the Sydney-mainland China market, which has emerged as a large target market for AirAsia, are more limited as Cebu Pacific doesn’t have as large a network in China. It currently serves the three major Chinese cities – Beijing, Guangzhou and Shanghai – with less than daily flights and has only one secondary destination – Xiamen, which is served with only two weekly flights. Growth in China is not likely at least for the short to medium term given the current state of relations between China and the Philippines. But Hong Kong – and potentially other North Asia connections as Cebu’s schedule thickens – will clearly play a big role in Cebu Pacific’s performance in the Sydney market and be a factor in potential expansion into other Australian markets. Mr Reyes says that since ticket sales for the new Sydney-Manila route began in mid-Jun-2014 booking have been “quite good”. Cebu Pacific plans to increase Sydney from four to five weekly flights from Dec-2014. A further expansion to Australia is possible in 2015 but requires an expansion of the Australia-Philippines air services agreement. The current bilateral is capped at 6,000 weekly seats, with 2,200 now allocated to Cebu Pacific and 3,800 to Philippine Airlines. This cap applies only to Melbourne, Sydney, Perth and Brisbane; Philippine carriers are free to serve other Australian airports with unlimited capacity. PAL is expected to fully utilise its capacity allocation from Dec-2014, when it plans to upgrade Sydney from four weekly to daily flights. Philippine authorities are keen to expand the bilateral which would enable both Cebu Pacific and PAL to expand. Mr Reyes says Cebu Pacific is interested in serving multiple destinations in Australia. 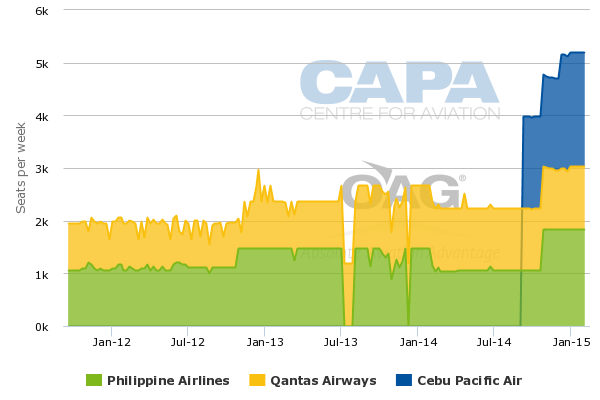 Cebu Pacific could also eventually serve Perth and Brisbane but Melbourne is more likely in the near to medium term. Cebu Pacific sees Perth as a potential destination for its future fleet of A321neos as the market is likely too thin to support an A330. It does not believe the A321neo will have the range to serve Brisbane although this could be re-examined after the new type enters service. Cebu Pacific however first needs to build a sustainable business case in Sydney, which could prove to be challenging. Cebu Pacific will have to overcome stiff competition and potential overcapacity on the Manila-Sydney route. 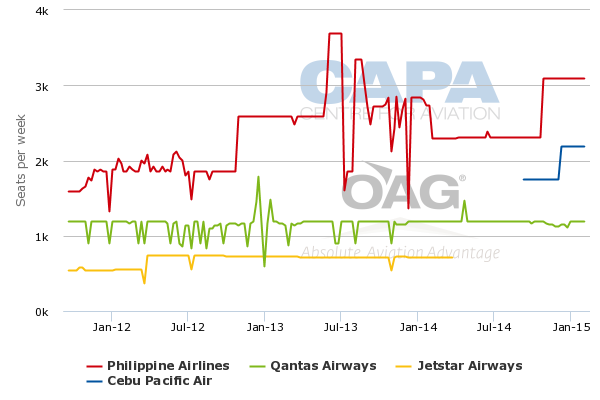 Qantas serves Sydney-Manila with four weekly flights while PAL’s recent decision to increase Sydney to daily in response to Cebu’s entrance puts pressure on a market which has traditionally been relatively small with large seasonal fluctuations. While PAL has been in Australia for decades Cebu Pacific is a relatively unknown brand in the Australian market. Sydney has a relatively large Filipino population but the community is not large enough to support 16 weekly flights except during peak travel periods such as Christmas and Easter. The 16 flights will provide about 2,200 one-way seats, nearly double current capacity levels. Transit traffic to North Asia should help but Cebu Pacific will face stiff competition in the Sydney-North Asia market from more established long-haul LCCs, particularly AirAsia X, which is now the fourth largest foreign carrier in the Australian market. Cebu Pacific will need to increase frequencies in several key North Asia markets in order to offer attractive connections from Sydney to cities other than Hong Kong. To be competitive and build a sustainable operation in Australia Cebu Pacific may also have to consider adopting an origin and destination pricing model and pursuing stronger relationships with travel agents, including online travel agents. Cebu Pacific is entering the Australia-Asia market at a time competition is extremely intense, pressuring yields and load factors at all airlines. It will take a lot more than low fares and a low cost structure to carve out a profitable niche. The second part in this two-part series of analysis reports on Cebu Pacific's long-haul low-cost unit will look at the carrier's plans for Saudi Arabia and the prospects of a Sharjah service. It will also examine the overall Philippines-UAE market including Cebu’s performance in Dubai.